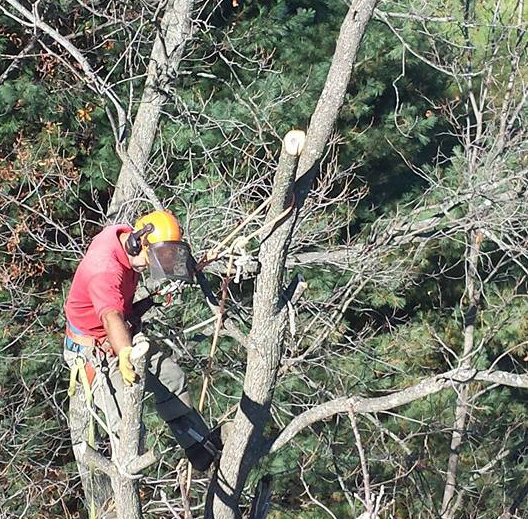 Staunton Tree Service provides all kinds of tree care to the New Hope area. When you are looking for a tree service company, it is important to call one that can provide you with a wide range of services. Staunton Tree Service does many different things, but does them all extremely well. Our workers are trained by us and in the industry, holding special certifications that are constantly getting updated. Our tools and equipment are all insured, as are we. Use the form below to request a free estimate on your tree service needs in New Hope, VA. When your trees start to die or cause problems, it is probably time to get them removed. Whether you are afraid of diseases spreading or you just want to put a pool in your yard, Staunton Tree Service can help you bring down the tree safely and easily. First we will look at your yard and the surrounding structures, trying to find the best approach to actually bring the tree down. Then, we will come up with a plan to actually do it, complete with the tools we will need and the timeline. When we bring down your tree, we ensure our safety and your safety. Then, we start the process. Generally speaking, we have everything planned so well that we don’t need all that much time. When your tree is down, we take everything with us so that you have a clean yard. Tree trimming and pruning is a popular job in New Hope because of the larger number of fruit trees and shrubs. However, it isn’t as simple as many people think it is. You need to take very precise cuts and ensure that you don’t go too far – or not enough. At Staunton, we have studied and practiced the art of tree trimming for a long time. We can help you get more shade, more fruit, and more pride in the look of your yard. Give us a call today and we can give you a free estimate for the trimming and pruning. Once a tree has been removed from your yard, the stump that remains needs to be removed for a few different reasons. The primary reason, at least from our perspective, is that the tree stump contains the disease or infestation that killed your tree. From the perspective of a homeowner, the stump is ugly and can get in the way of other things in your yard and maintenance. We can quickly and painlessly remove the stump from your yard at very little cost to you. Call us today for a free estimate. As a home or business owner, you have to take responsibility for the health of your trees. This means that occasionally you might just want to get them checked over to see how they are. When we check your trees to see how healthy they are, we look at everything possible, from the roots to the leaves. We use different tests to see how healthy they are. If we find anything that is alarming., we immediately start to remedy the problem. Give us a call today, if only to find out that everything is okay. Storms in New Hope aren’t always bad, but when they are, it can cause you a lot of problems. After a storm, your trees are weak, they might have fallen, and they are in desperate need of some help. We can step in at this point and clean up, repair, and maybe even prevent it from happening again. We use special equipment and skills so that we can, if possible, save your trees. New Hope has a lot going for it, and with Staunton Tree Care, it might just have even more beauty. Our team will work with you to get the best looking yard you possible can. If you don’t see the tree service that you need for your yard listed above, give us a call and we can work with you.